Original fast, smooth easy to clean Swiss bearings made for skates! Made for skates, not for machines so they glide faster and longer. 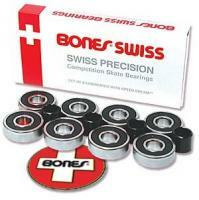 Bones Swiss 7mm bearings fits only 7mm axles, which are not standard on all plates. Enough for 8 wheels - one pair of roller skates with 7mm axles. Qube Bearings Teal set of 16 Abec 5 rated. Do you have a cheap pair of rollerskates that don't roll? Switch to the Teal bearings for a great roll on inexpensive skates. Switch them out your self.